What do you do when a Viceroy of the British Empire comes visiting? Build him a palace to stay in. 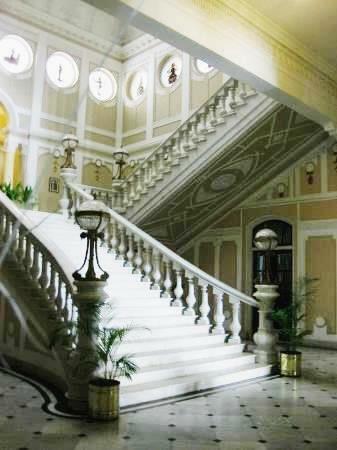 I’ve said this before, and I say it again – I love old palace hotels in India. I love the majesty, the history, the crumbling edges, and the slight creepiness of these old buildings. 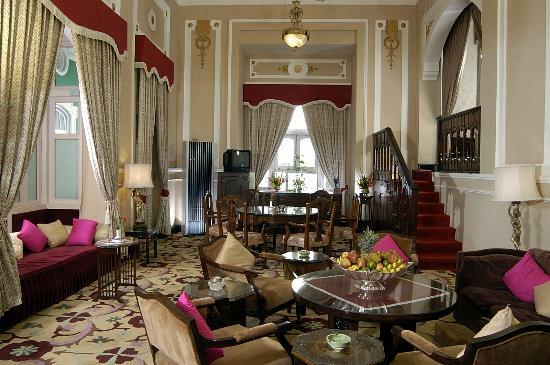 The biggest palace I’ve stayed in so far is the Lalitha Mahal Palace Hotel in Mysore, south India. Lalitha Mahal looks so grandiose and imposing, rising out of the dry Indian landscape like a very giant, very formal, very white wedding cake. It’s also very European looking, for an Indian palace. There’s a reason for this. 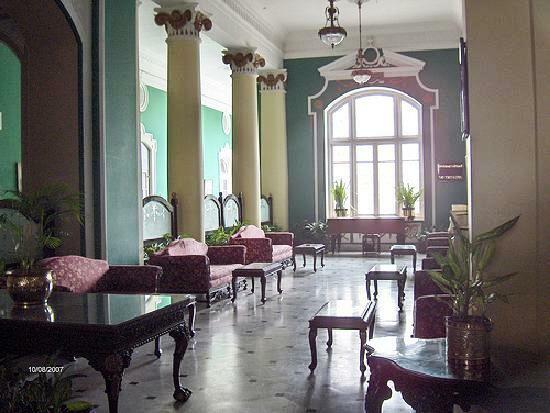 Lalitha Mahal was built as a guest house – though not the kind any backpackers would recognize. It was built in 1921 by the Maharajah of Mysore especially for the visit of the British Viceroy of India, who was the official representative of the British monarch back in the day when India was ruled by the Brits and the sun never set on the British Empire. 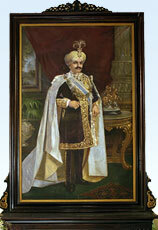 By the way, the Maharajah of Mysore lived comfortably in his own fabulous palace which is one of the biggest, most sumptuous palaces in all of India, with ballrooms the size of football fields and doorways the size of elephants. You’d think there might be an extra wing or two to fit a couple of houseguests. But guests of extreme stature deserved a palace to call their own, and besides, I’m sure the Maharajah liked everyone to have their own space to roam the halls in their pajamas. 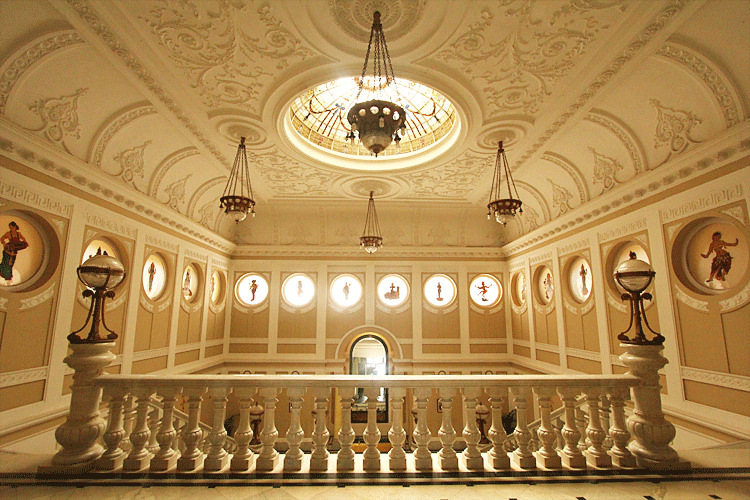 Lalitha Mahal was subsequently used as a guest house for all of the Maharaja’s VIP European visitors. I say old chap, does this dome look familiar? Lalitha Mahal was fashioned on the lines of St Paul’s Cathedral in London, especially the central dome, though this one is much bigger, grander, and whiter than the original. The building is painted pure white and was converted into a heritage hotel in the 1974 and is government run. 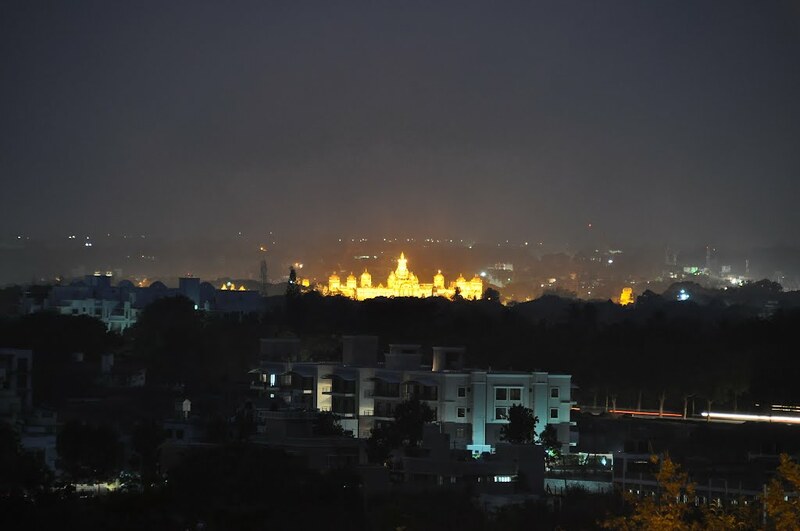 It’s located 5 km from Mysore Palace near Chamundi Hill. Built on a rise in the landscape, its gleaming white glory can be seen from miles away. My friend had organized this trip around south India and we were passing through Mysore for only one night. It was a whirlwind itinerary, and I didn’t know much about Mysore until we got there. So seeing this grand white vision of neo-classical architecture materializing before us as we drove towards it in the bright Indian sunshine was exciting, not to mention blinding. We arrived around midday in time for lunch, which was in the spectacular blue dining room that had originally been the grand ballroom. Our little group of three people were the only diners in the cavernous hall and the only other person seemed to be the waiter who brought out an appetizer dish of fresh masala onions. I’d never had this dish before and discovered it was so incredibly tasty that I wolfed them down and ordered another dish right away. 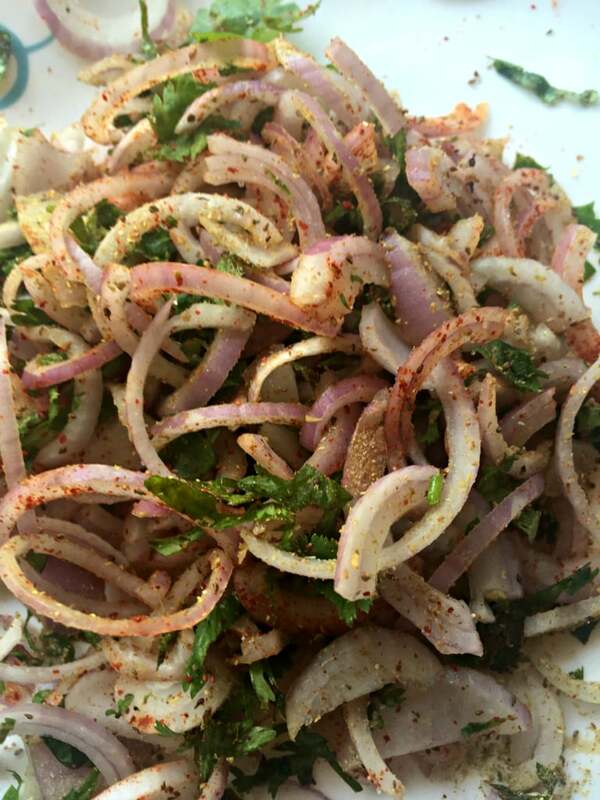 I can’t remember what else I ate on that whole trip but I remember those spicy, zesty, crunchy fresh julienned red onions drenched in squirts of tangy lime and sprinkled with an exotic Indian masala spice mixture. Talk about a flavor explosion in your mouth! On a hot, sweaty tropical day, these flavours woke me up and put some energy back in my system! A tour of the palace revealed the sumptuous design of a European palace, with a splendid viceroy room, banquet hall, a dancing floor and a spectacular curved Italian marble staircase. The ornamentation is said to be replicas from various palaces in Britain. 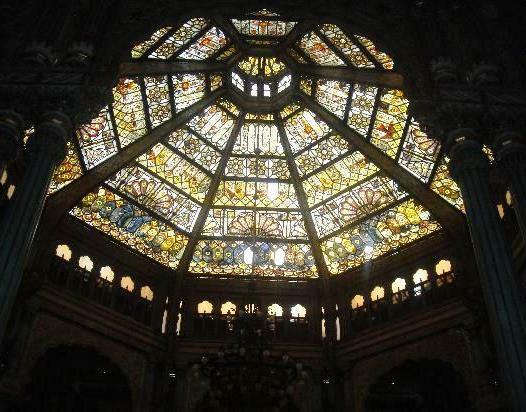 Stained glass is a big decorative element both inside and outside the palace, on doors, windows and ceilings. A life-size elephant statue adorned with spectacular bone inlay in the reception lobby. 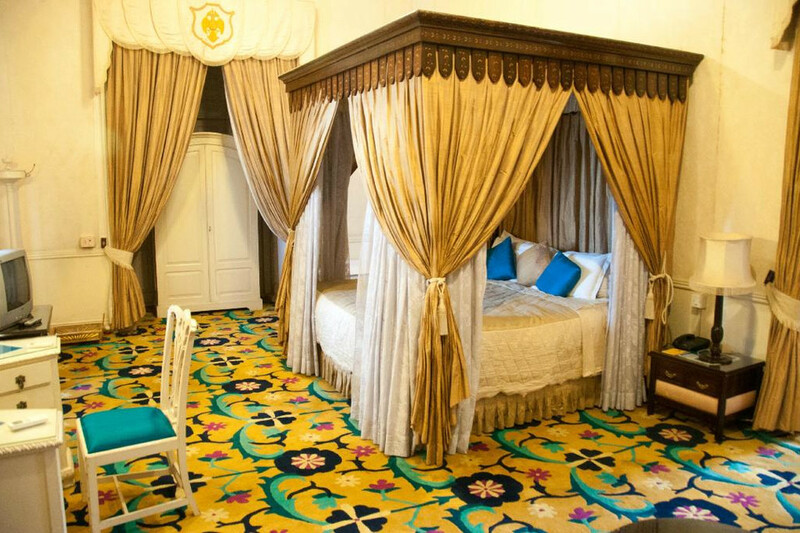 The interiors are filled with royal portraits of the ruling Wodeyar kings, Italian marble floors, Belgian crystal chandeliers, cut glass lamps, ornate furniture, mosaics and Persian carpets, and all the magnificence you would expect to find in a royal abode. Of course there had to be the requisite stuffed lion and tiger trophies too, this being the land of tiger hunting and all. The elephants are out on festival day at the Mysore Palace. The elephant gates are behind them. We visited the spectacular Mysore Palace, one of India’s most extravagant maharaja’s palaces. The size and the insane splendor were fantastic. I especially loved the palace’s huge arched gates whose grand size was made to let elephants pass through during festivals and parades. 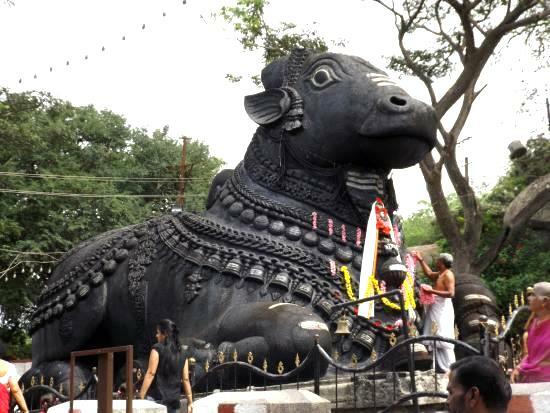 After the Mysore Palace we visited the Sri Chamundeswari temple on top of Chamundi hill, where my favourite sight was the giant Nandi bull statue. That evening we had an unmemorable dinner in a local restaurant, and then went to the magnificent Mysore Palace for a classical Indian music concert. We’d found out that the Mysore Palace hosted a free classical music concert in one of its ballrooms once a week and luckily we happened to be there on that day. Sitting on the floor of the elaborate ballroom watching the musicians fill the air with sitar, drum and flute ragas is one of the beautiful experiences of India that leave a lasting impression on the mind and senses. It was late and very dark by the time we got back to our rooms at Lalitha Mahal, worn out from our busy day and ready to crash into bed. My room looked nothing like this. However I didn’t have an easy time crashing into bed at all. For a palace of such lavish size and magnificence, the guest rooms that we stayed in were strangely nondescript and bland, like a mass market chain hotel. Or a government-run hotel, which is what it was (We weren’t in the Viceregal suite or anything near it). I had my own room which was a normal size, perfectly typical hotel room with a bathroom, two beds, and a desk. All the furniture was brown. It was the most uninteresting room you could possibly imagine. But something about the place gave me the creeps. It wasn’t just the air of an old building that felt weird. The room had a little seating arrangement with two old fashioned armchairs facing the bed where I was sleeping. Sounds normal, no? No. Somehow I was overcome by the weird feeling that there were two people sitting in those chairs looking at me sleep. I even had a very clear picture of what those two people looked like. How crazy is that? I was so disturbed that I couldn’t rest and I had to get out of bed and re-arrange the chairs so that they faced each other and not my bed. That was the best I could do since I couldn’t drag them anywhere else in the room, plus it was very, very late. I felt better after that and managed to fall asleep. I woke up the next morning, opened the curtains to a new day and everything seemed nice and normal in the sunshine. (It always does. Sunshine makes everything better). I still can’t explain why I had such a weird feeling but to this day I still have a clear picture in my head of the room and the two people sitting in those chairs. (For all I know, they could still be sitting there, watching the next people while they sleep). Brrrrrr. We left next morning for the next leg of our trip after breakfast in the magnificent blue ball room. At breakfast, we were still the only guests in the room, and possibly the whole hotel. What an unusual place. As palaces go, this one’s best glory days were well in the past. It was built as a showy guest house, never really a home, so it hadn’t really been lived in, and its vast size and the relative emptiness added to its hollow feeling. I wouldn’t mind going back, and mostly likely it will feel different a second time around; my visit was quite a while ago so it’s probably refurbished and cozier these days. And I’ll take a roommate with me next time. 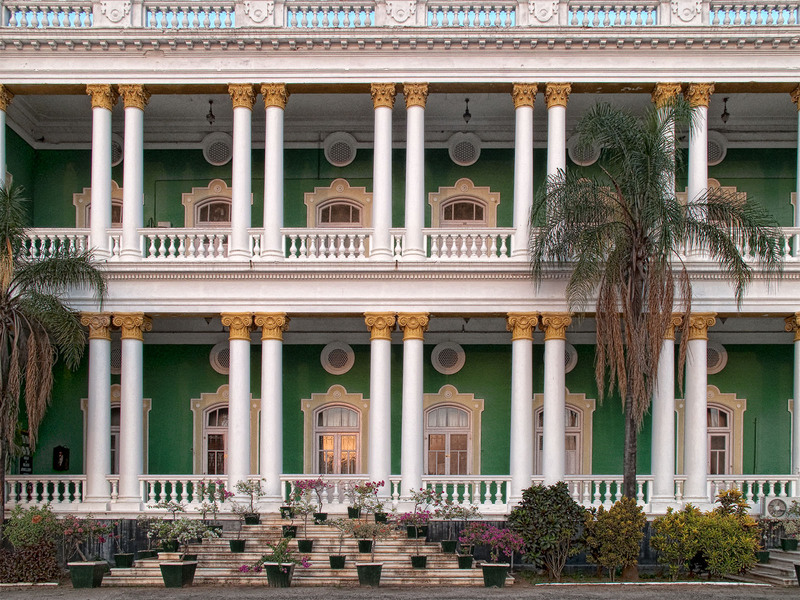 Have you been to Lalitha Mahal Palace or Mysore Palace in Mysore? How was your experience?